Construction has been underway, but few details have emerged regarding the massive project that will bring Pandora and the world of AVATAR to Disney's Animal Kingdom Theme Park. Recently Disney shared some of the details around this much talked about, and sometimes polarizing project. 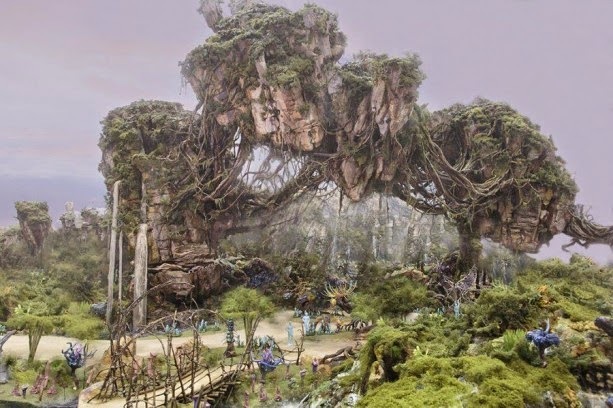 The incorporation of James Cameron's vision of Pandora with the detail oriented design team at Disney led by Joe Rohde, is bringing something never before seen at any Disney Theme Park. Since we first broke ground last year at Disney’s Animal Kingdom, we’ve been looking forward to welcoming guests into Pandora, the mythical land based on the blockbuster film AVATAR. We’re having a lot of fun dreaming up ways to bring to life the land’s iconic elements from the magnificent floating mountains to the interactive bioluminescent forest, and even to the soaring banshees. 0 comments to "Disney Shares Details Of AVATAR Construction At Disney's Animal Kingdom"